Dealing with tantrums is very stressful but some strategies may help depending on the situation. Antecedent is what happened immediately before the tantrum. Behavior specifies details about the outburst. Consequence is what happened immediately after the tantrum. It is a good idea to include the time of day, the people present and the place that the incident occurred on the chart. These details can help uncover a pattern and possible triggers. For example, the child may tend to have outbursts 20 minutes after lunch. Parents can continue exploring the possible triggers, noting what the child eats for lunch and whether a tantrum occurs after eating certain foods. While the ABC chart can help determine a pattern, it isn't very helpful when you are in a public place and your child has a meltdown. Viable options for dealing with tantrums whether at home, school or in the community may offer relief. 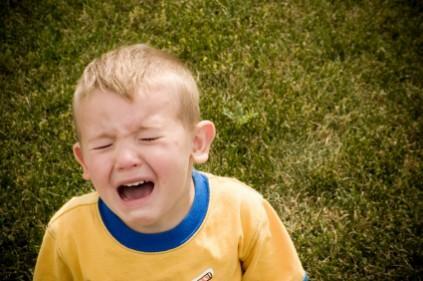 The strategies for dealing with tantrums in autistic children may not be appropriate for everyone. Your parenting style is a factor to consider and following through with temper taming techniques that go against your personality may not be effective. In some cases, the techniques work after some trial and error. Withhold attention, formerly referred to as "planned ignoring", may seem like an ineffective way to deal with tantrums but when you think about the possible reasons the behavior occurs, it can work. The approach requires parents to continue as if nothing is wrong, giving the child no feedback for the behavior. The approach may require several trials before it takes effect. Keep in mind that you are ignoring the behavior, not the child. Stay calm and consistent although this may seem impossible considering the emotionally-charged nature of the behavioral outburst. Highly emotional responses can feed the behavior. Get to a safe environment to ensure that your child does not harm himself, others or property. Redirect the behavior at its onset. Once you recognize that a meltdown is about to occur, immediately redirect the child's behavior to something else. Use signal phrases to help your child calm and organize his behavior. This can include prompting her to say "Not yet" or "I wait" as a way to internalize the directions. The phrases empower the child rather than controlling him. Consider the difference between telling your child that he has to wait and him telling himself that it is time to wait. Visual cues may help children who can't talk. The Picture Exchange Communication System (PECS) uses image cards that include quiet, stop, wait and other cues that can help the child know what is expected and what to expect. Make consequences swift and meaningful to ensure that the child recognizes that the behavior will not result in what she wants. Sometimes this translates into riding it out, which can be painfully embarrassing in public places but giving in to demands to quell the outburst only reinforces the behavior. Counting can help for some children who know that they have till the count of three to calm down. With practice, may kids immediately stop the behavior at the count of one. When practicing this strategy, use no other words than the numbers and when you get to three, follow through with a consequence, like a time-out. Use familiar objects to redirect attention. Some children may have sensory issues that need to be met. Choose a favorite object and allow the child to "stim" in stressful situations. Keep focus on your child is another difficult piece of advice to follow when the eyes of strangers pour over the incident. However, worrying about what other people think about your parenting skills is not going to help matters. Tantrums are a great source of stress but it is important to keep in mind that autism is not an excuse for bad behavior. Sensory issues, hunger, fatigue and frustration can come into play, and addressing the child's needs can ward off tantrums. Meltdowns occur and some simply can't be avoided. They all share one thing in common; they do end eventually.